This lesson enables students to understand the different changes they will endure throughout puberty. They are able to do this lesson independently/pairs/ or small groups. 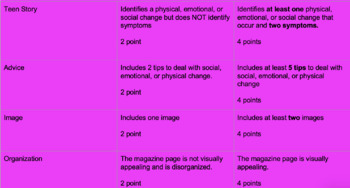 Students will sort physical, social, and emotional changes of puberty in a chart on a ppt, the ppt can also be printed off, so that this activity can be done by hand. Next, the teacher will assign students a puberty topic, such as body growth, acne, body image, menstruation, etc. There are examples listed in the ppt. 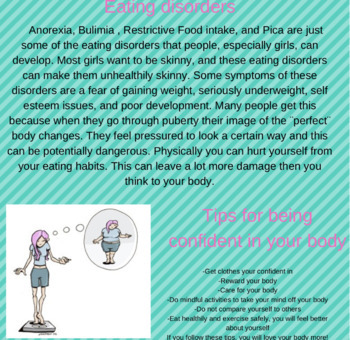 Next, students will create a magazine article on their assigned puberty topic using canva, or on paper. I left the rubric open ended, but it is able to be changed. There are student directions directly within the ppt. I also attached a student example. I titled this lesson advice to a teen from a teen.